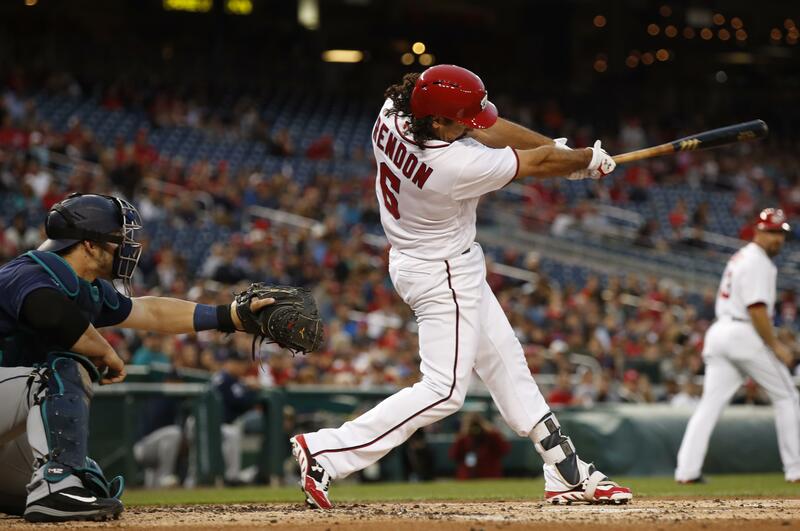 UPDATED: Wed., May 24, 2017, 7:51 p.m.
What happened: Anthony Rendon hit a three-run home run – his third in last two games – and the Washington Nationals cruised to a 5-1 win over the Seattle Mariners on Wednesday at Nationals Park. The Nats put up a four-spot in the first inning, including Rendon’s eighth home run of the season, added another in the second and went into cruise control as the Mariners put up very little resistance in this one. M’s rookie starter Sam Gaviglio went six innings after a rough couple of initial frames. He allowed five runs – only one earned – on six hits and two walks with one strikeout. Nats starter Tanner Roark went seven innings and allowed one run on eight hits with no walks and eight strikeouts. The M’s tweaked the lineup a bit and it worked, at least in the first inning. With one out, Kyle Seager hitting second doubled to center, then scored on Robinson Cano’s single to left for a quick 1-0 lead. It didn’t last long. Trea Turner reached on a throwing error by Jean Segura and promptly stole second. Jayson Werth walked behind him. Gaviglio got Bryce Harper to fly to right and Turner moved up a base, then scored on Ryan Zimmerman’s sacrifice fly to right to tie it. With two down though, Daniel Murphy ripped a double to the right-field corner and Anthony Rendon – who homered twice on Tuesday – hit one into the visitors bullpen in left-center for a three-run home run. The Nats picked up another run in the second. Michael Taylor bunted for a hit to lead off, went to second on Tanner Roark’s sacrifice bunt, and scored on Turner’s single to right. Turner stole second again, but Gaviglio struck out Werth and – after intentionally walking Harper – coaxed Zimmerman to ground out to end the threat. Either the Nats got tired running the bases or Gaviglio settled down – the rookie righty shut the Nats out for the next four innings. Deposed closer Edwin Diaz took over for the seventh and walked two in a scoreless inning with one K.
Look, the Mariners are just suffering being forced to send minor league pitching against big league rosters, led alone a lineup as deep and talented as the Nationals, who lead the majors in runs per game at 5.82. The losing streak reaches five with six more games on this long road trip. Hero: Robinson Cano. 3 for 4, RBI. Made solid contact and has to feel like his swing is rounding back into shape after the long layoff. Goat: Jean Segura. He’s been exceptional this season but in this one went 0 for 4 with the first-inning error which led to a run. The Seattle Mariners (20-27) at the Washington Nationals (27-17) on Thursday at 9:05 a.m. (yup) at Nationals Park. LHP Ariel Miranda (3-2, 4.28) faces LHP Gio Gonzalez (3-1, 2.86). Say what you will about the pitching but over the course of the last five games, all losses, the M’s have scored one, one, one, one and one run. That’s one in each game. Unless your starting staff features Walter Johnson, Bob Gibson and Sandy Koufax, you aren’t winning many of those games. … There is mixed news on the injury front. … And, yes, there was a transaction made, and a trade as well. The latter involved adding a minor league outfielder. … Why are the M’s playing so early today? It looks like bad weather is on the horizon for D.C. … The Nats needed the start they received in yesterday’s 5-1 win, that’s for sure. Published: May 24, 2017, 6:49 p.m. Updated: May 24, 2017, 7:51 p.m.